Providence-Providence Park Hospital in Novi is one of the Ascension hospitals that has seen layoffs recently. Ascension Health in Michigan is nearly complete with its employee layoffs and management restructuring as it has laid off 500 workers, including 20 executives or managers, at its 14 hospitals in Michigan. Gwen MacKenzie, Michigan market executive of Ascension Michigan, said in an exclusive interview last Thursday with Crain's that the layoffs cover a wide range of job categories: nurses, medical therapists, technicians, unit clerks and other support service employees. "We have transitioned close to 500 associates. Every one of those has been painful and hurtful," said MacKenzie, a former oncology nurse who has headed up Ascension Michigan since 2014. "You probably wonder why we were not talking more openly about it. It is very private and sensitive matter that we take very seriously on behalf of our associates." Ascension Michigan employs about 26,000 people, and the layoffs so far are a little more than 2 percent of the workforce. But MacKenzie said more layoffs are expected after Ascension completes employee-to-patient ratio reviews and notifies the Catholic health system's 25 collective bargaining units, which account for 22 percent of its workforce, or 5,800 workers. Further layoffs of those unionized employees could take several months to complete, she said. "We don't expect a large number" of more layoffs, she said. Over the past three weeks, Crain's has reported hundreds of layoffs at Ascension hospitals in Michigan. Sources suggested layoffs could eventually total this year up to 1,000, which could include moving several hundred employees into a contract management company. MacKenzie did not specify a final number because of the ongoing reviews and labor talks. "We think this is our new normal. The landscape we are navigating here is the new reality," said MacKenzie, who worked as a nurse practitioner and administrator at Detroit Medical Center for 25 years until 2005 when she became CEO of Sarasota (Fla.) Memorial Hospital. "We are the largest system in the U.S. and try to be transformational and ahead of changes," she said. "We make adjustments as fast as we can, but as a Catholic ministry we need to be sensitive to vulnerable populations." With burdensome regulations getting worse and growing reimbursement cuts from government and private payers facing Ascension and all health systems, MacKenzie said, Ascension needs to reduce costs and reorganize to prepare for patients seeking lower-cost health care options. "We believe all health systems (will need to cut expenses and reorganize). We may be a leader as all health systems go through the same rapidly changing landscape with reimbursement decline, people transitioning to outpatient (services)," she said. "We are focusing on ambulatory growth. ... Health care costs are a major issue and we are addressing that now." Ascension Michigan posted fairly strong financial results in 2017. Thirteen of its 14 hospitals Michigan earned a total of $114.6 million on operations, according to American Hospital Directory, a Louisville-based consulting firm. No data for Michigan was available for 2018. Financial reports on Genesys Regional Medical Center in Grand Blanc Township were unavailable for 2017. In fiscal 2017 ended June 30, Ascension's St. John Providence Health System, a five-hospital regional system in Southeast Michigan, earned net income of $110.1 million on $5.83 billion total revenue, for a 2.1 percent total profit margin, AHD said. The data comes from Medicare cost reports that hospitals are required to submit to the federal government. Only St. John River District Hospital in Southeast Michigan lost money, $4.8 million on net patient revenue of $82.9 million. 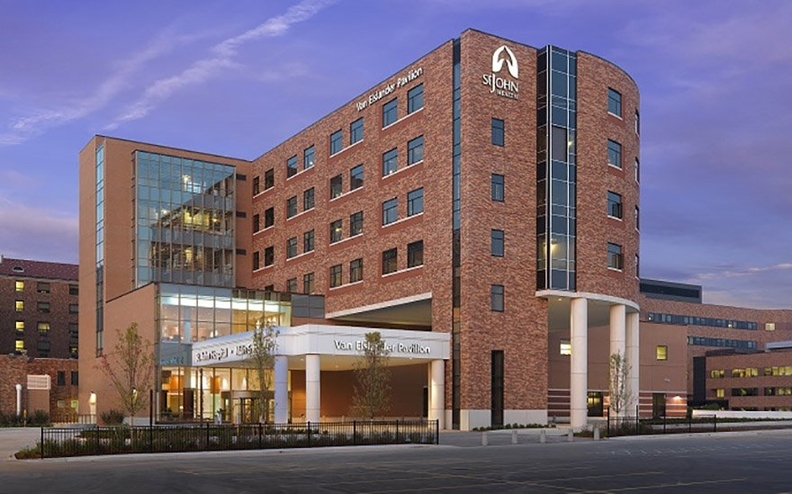 Flagship St. John Hospital and Medical Center in Detroit reported net income of $36.9 million; Providence-Providence Park Hospital earned $39.9 million; and Crittenton Hospital had a $9.7 million gain. Two other hospitals in Michigan reported operating losses: St. Mary's of Michigan in Saginaw, $21.3 million loss; and St. Joseph's Hospital in Tawas City, a $162,000 loss. Borgess Medical Center in Kalamazoo earned $26 million on operations last year. Meanwhile, St. Louis-based Ascension Health, the nation's largest nonprofit system with 141 hospitals in 24 states, reported a 78 percent decline in operating income to a 0.7 percent margin during the first six months of fiscal 2018 ended Dec. 31 from 3.3 percent margin in 2017. It has been taking steps the past year to shore up its profit margins and has cut expense increases from 9.1 percent in 2017 to 1.5 percent the first six months of the year. MacKenzie said in a statement that "it's our goal to have a sustainable margin so that we can continue to provide affordable, accessible care to all, with special attention to the poor and vulnerable." But MacKenzie said Ascension Michigan wasn't directed or mandated by Ascension in St. Louis to cut specific numbers of employees. Its goal is to reduce expenses by $60 million this year. Gwen Mackenzie is Michigan market executive of Ascension Michigan. "We create these solutions together. This is our work," MacKenzie said. "It is not imposed on us by anyone. We created staffing plans" (using) benchmarks shared by multiple markets. Decisions on layoffs, cost reductions and restructuring going on in various Ascension markets in Indiana, Wisconsin and Texas were made by senior vice presidents like MacKenzie, she said. Those four markets account for about half Ascension's 141 hospitals and half its $22.6 billion revenue. "Those markets are the larger markets. We are 20 percent of Ascension in Michigan," she said. "We tend to drive health care trends. We are more standardized at Ascension, across the markets as a national health care organization." MacKenzie said the Catholic health system is using a standardized benchmarking approach in its largest markets to reduce clinical variations of tests and procedures, to improve patient safety and quality and evaluate the optimum number of employees in various departments. Adhering to best practice employee staffing ratios can help manage declining inpatient volume, the move to outpatient services and the need to improve worker productivity, MacKenzie said. "These staffing benchmarks are in place at some of our ministries," she said. "We looked to the best performing (hospitals)" that staff to inpatient and outpatient volume, she said. MacKenzie said the restructuring began last summer and started layoffs of 28 full-time equivalent workers in management suites, including 12 vice presidents, five directors, three managers and eight support staff. Ascension Michigan's management to staff ratio increased to 1-10, still slightly more efficient than the industry standard of 1-8, she said. "We started to look at our administrative infrastructure" last July, MacKenzie said. "We needed a better staff ratio and started" with management. Over the past two years, Ascension Michigan has been combining executive jobs between several hospitals and created a seven-member statewide corporate team that includes a chief operating officer, chief nursing officer, chief medical officer and chief financial officer. For example, Jean Meyer has moved to Michigan corporate COO from her previous job as CEO of St. John Providence. The St. John Providence CEO job is unfilled. Besides having regional executives share multiple hospital oversight responsibilities, MacKenzie said some state services have been moved to the corporate level, including human resources, marketing, mission and finance. At hospitals, Ascension also is cutting other costs, including information technology, real estate, travel, purchasing and supply costs. Ascension has cut contract labor costs to nearly zero from $21 million in 2017 and is looking at more flexible staffing models for nursing and other professions. "We reduced overtime by associates, decreased it by one-third," MacKenzie said. "We looked at open positions and the necessity to post and refill positions without rigorous evaluations. We didn't fill 150 open positions." MacKenzie also addressed a previous Crain's story that up to several hundred patient transporters and maintenance workers may be moved to Ascension's environmental services contract management company, Touchpoint Support Services. "We are still discussing" that, she said. Touchpoint currently manages Ascension's housekeeping and dietary staff. At St. John Detroit, Ascension's flagship hospital in Southeast Michigan, MacKenzie said the several dozen patient care technicians that were laid off were not part of Ascension's national model. "It was only at St. John. Others (Ascension hospitals) have not had (PCTs) for some time," she said. The unit clerks in nursing departments who were laid off also can be replaced, in part, by improved technology, she said. "We talked about the unit clerks this morning. We don't have to use the phone. There are other ways to communicate electronically. We have been working on that and will accelerate that work," she said. MacKenzie said Ascension also is looking at moving clinical programs to less expensive settings. She did not specify the hospitals, but they include two audiology clinics, a coagulation clinic and possibly shifting inpatient pediatric services at one hospital. Nurses, doctors, former and current employees who have talked with Crain's about the job cuts have expressed anger that top executives at St. John and Ascension in St. Louis appear not to be participating in the expense reduction. For example, Ascension Health CEO Tony Tersigni earned $17.5 million in 2017 in total compensation when base salary, bonuses and other compensation are tallied. Tersigni headed up St. John Providence from 1995 to 2000. MacKenzie declined to comment on that issue. In 2008, when the nation was beginning to reel from the massive economic downturn, former Beaumont Health System CEO Ken Matzik called a press conference to announce more than 165 layoffs of employees. Standing in from of print reporters and television cameras, Matzik also said he and other top executives and employed doctors also would take a 10 percent pay cut. Department managers took a 4 percent pay cut. Without the executive pay cuts, Matzik said another 225 workers would have been laid off. Despite nurses and doctors telling Crain's they fear the downsizing will affect patient safety and quality because they will be spread even thinner than before, MacKenzie said she didn't expect any negative impact. "This is the new normal, how we redesign work," she said. For example, the use of electronic medical records will save nurses time in patient assessments, she said. "People are finding it easier," she said. Managers at Ascension hospitals, she said, round frequently to talk with nurses and other employees to get a sense of how the changes are affecting them. "Anything the nurses are concerned about, I am concerned about," she said. "Our focus is trying to make their work as efficient as it can be." "Ascension layoffs total 500, with more coming" originally appeared in Crain's Detroit Business.